Recently found another interesting antiwar protest. 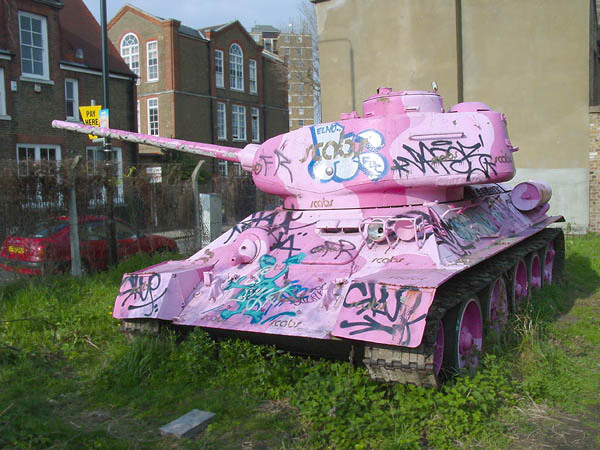 This time, it’s an underground movement of people who paint tanks pink! Actually, it’s kind of difficult to think of a way of emasculating something even more than spraypainting the whole thing pink. Our culture just has this in-built symbolism that pink = girly stuff, which makes it great for activist art like this. I’ve also seen t-shirts with pink army men on them, so this doesn’t appear to be limited to public activist art. There is also a link here to a story about an account regarding a pink tank piece, Operacio Elefant Rosa (Operation Pink Elephant! ).